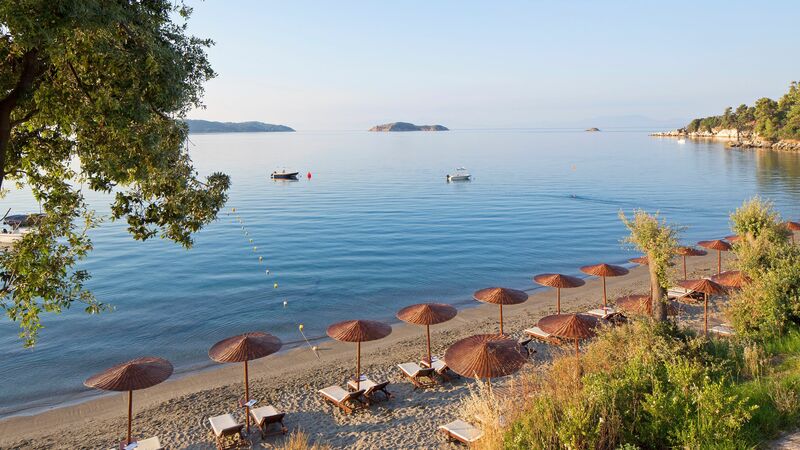 Vasilias Beach holidays take you to a golden sandy stretch of beach just minutes away from the bustling centre of Skiathos Town. Located on the east coast of Skiathos island, this area has some of the best beaches, with crystal clear waters and a luscious backdrop. Behind the beach are the traditional Greek whitewashed houses with terracotta roofs which will take you back to days gone by in this idyllic town. Those wanting to immerse themselves in the island’s culture will find lots of friendly locals here, with chances to see the traditional way of life in small local shops and cafés. The lively tavernas are dotted throughout the town, and many have been run by the same family for generations. Here you’ll find traditional Greek mezze platters, fresh local olives, fine wines, exquisite seafood, and lots more. After dinner, head to one of the friendly bars for live music and a selection of drinks. Luxury holidays in Vasilias Beach are all about the opportunities to relax. Head to the beach and find your spot before spending the day soaking up the sun whilst ordering drinks and snacks to your lounger. Alternatively, take the scenic walk or drive into Skiathos Town where there is a further selection of restaurants and bars, as well as museums, galleries, theatres, and lots more. When it comes to hotels, Vasilias Beach offers an excellent selection. And at Sovereign we’ll help you find the right one for you. Speak to one of our Trusted Advisers who will use their expert knowledge in holiday making to create the ideal trip for you. Stay at the K B Suites and Spa and you’ll find yourself overlooking the spectacular bay below. This adults only hotel offers three restaurants, an infinity pool, fitness centre, and a chance to fully indulge at the onsite spa. Skiathos Town sparks into life in the evenings when its restaurants, tavernas and craft shops open up for trade. For something really special, head for the old quarter, where you can get a taste of traditional island life. Transfer time from Skiathos airport to Vasilias Beach is approximately 20 minutes.